Coit Tower in San Fran, a place to see ! Coit Tower, also known as the Lillian Coit Memorial Tower, is a 210-foot (64 m) tower in the Telegraph Hill neighborhood of San Francisco, California. 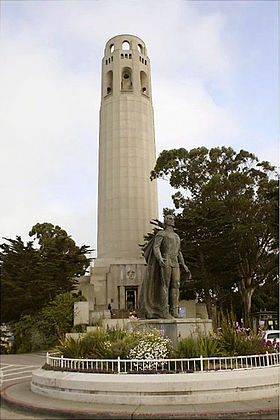 The tower, in the city'sPioneer Park, was built in 1933 using Lillie Hitchcock Coit's bequest to beautify the city of San Francisco; at her death in 1929 Coit left one-third of her estate to the city for civic beautification. The tower was proposed in 1931 as an appropriate use of Coit's gift. It was added to the National Register of Historic Places on January 29, 2008. The art deco tower, built of unpainted reinforced concrete, was designed by architectsArthur Brown, Jr. and Henry Howard, with fresco murals by 27 different on-site artists and their numerous assistants, plus two additional paintings installed after creation off-site. Although an apocryphal story claims that the tower was designed to resemble a fire hose nozzledue to Coit's affinity with the San Francisco firefighters of the day, the resemblance is coincidental. This is a must for a SF traveler. I had a list of things that I wanted to see on our first day in SF & this was one of them. It was quite a climb through the streets to the tower, but the views from the top were excellent. The murals inside are so interesting. A cheap and great way to see the city and take some great photos.